Barely-Cooked Green Beans with Tahini-Lemon Sauce are a great Thanksgiving side dish, or make them for any special dinner! Check out Vegetable Recipes for more recipes like this one. 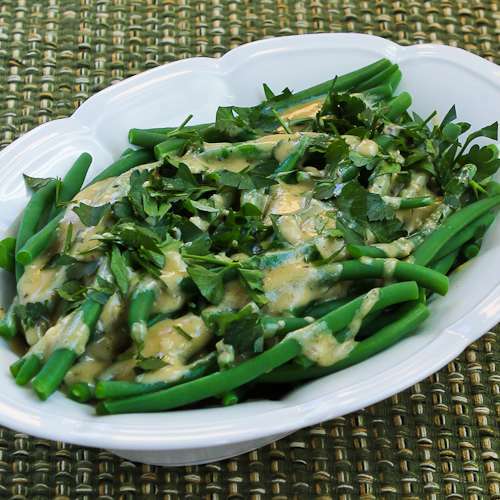 Click here to PIN Barely Cooked Green Beans with Tahini-Lemon Sauce! This new recipe for Barely-Cooked Green Beans with Tahini-Lemon Sauce was quick enough to be super-easy for Thanksgiving, and it was something that Jake and I gobbled up when we tested the recipe. If you don’t feel adventurous enough to have this for Thanksgiving I hope you’ll try it another time, because these beans are really good! Some people might not be familiar with Tahini, which is a middle eastern ingredient made from ground sesame seeds. It’s an essential ingredient in hummus, and adds wonderful sesame flavor to many dishes. I think Tahini goes especially well with vegetables, and if you enter “tahini” into the search bar on the blog you’ll find a lot of recipes where I’ve used it. You can find it at ethnic markets, health food stores, and large grocery stores. Trim both ends of the green beans. (I do this by gathering a bunch in my hand and standing them up on the cutting board so the ends are even, then do the same thing on the other side.) Cook the beans for 3-4 minutes in boiling salted water. Drain immediately and rinse with cold water so they don’t keep cooking. While the beans cook, whisk together the tahini, lemon juice, minced garlic, and olive oil to make the sauce and season with salt and fresh ground black pepper to taste. Coarsely chop the parsley. When the beans have drained, lay them out on a plate, drizzle sauce over, and garnish with chopped parsley. Serve Barely-Cooked Green Beans with Tahini-Lemon Sauce right away and enjoy! Green Beans with Bacon from It’s Yummi! When the water is boiling, stir in the salt and add the green beans. Cook for 3-4 minutes, or until they are barely tender-crisp. (The original recipe said 3 minutes, but we let them go for another minute.) Drain beans and rinse with cold water; then let them drain well. While the beans are cooking whisk together the Tahini, lemon juice, minced garlic, and olive oil to make the sauce. (I used my fresh-frozen lemon juice. Taste to see if you’d like more garlic; then season to taste with salt and fresh ground black pepper. Wash and coarsely chop the parsley if using. To serve, arrange the beans on a serving dish, drizzle sauce over and garnish with the parsley. Serve hot. Recipe adapted very slightly from Fine Cooking. Tahini and olive oil would both be considered “good fats” for the South Beach Diet, so Barely-Cooked Green Beans with Tahini-Lemon Sauce would be a great low-carb side dish that would be approved for all phases of the diet, and it would also be good for most low-carb eating plans, including Paleo. Thanks Kalyn! I’m not a big string bean eater, but these were delicious. I didn’t have enough string beans, so I added some mushrooms. Yum! So glad you enjoyed it. I like the sound of mushrooms with this! It totally is a food paradox, I agree! I’ve never cooked with tahini…maybe Thanksgiving is the time to try it out 🙂 Thanks for including my green beans and pecans recipe! That’s a recipe I vaguely adapted from one of YOUR recipes! I knew other bloggers would get it! Fun hearing that I featured a recipe that was inspired from my recipe too! Your recipes always look good! Grean beans, lemon and tahini? This is a flavor combo made in my kind of heaven. Thank you for the idea and recipe. Glad you enjoyed the egg muffins; thanks for the shout-out! I came over to thank you. I made your egg muffins from 2008 and I can tell you, they are still delicious. I just wrote them up. Mine are not as pretty as yours but I bet they taste as good. Now, these beans are calling my name. Wow, those look delicious, Kalyn! I have to admit that I have never cooked with tahini (even when I make hummus I use toasted sesame seeds instead). Maybe it's time to change that. Also, thank you so much for including my recipe in your post!! Hi Kalyn, I just added the bean recipe to my meal plan for Thanksgiving. Out to buy ingredients today. Jeanette, I love tahini, and I think this sauce would be good on a lot of things! Mark, glad you liked it. I heared that green food is extremely good for health. I am not a big fan of green food. Well i tries your recipe and found it awesome. Thanks for sharing. I am looking for more healthy dishes. I have to say I had never had tahini sauce on vegetables until recently when I tried it with roasted beets – it was probably one of the best ways I've enjoyed beets, so I am not at all surprised to see it here with green beans – definitely going to give this a try. Thanks Shirley! And this sauce would be good on so many veggies. You are a green bean queen, Kalyn! I love your green bean recipes, especially the Roasted Green Beans with Red Bell Peppers, Garlic, and Ginger, so I'm happy to see you have it in this listing. That's become a family favorite and was requested for Thanksgiving again. 🙂 I'll try this recipe for myself in the near future. Joanne, I bet you would like this, and the sauce would be good on other veggies too. Thanks Lydia! This may not be everyone's idea of a Thanksgiving dish, but it would suit me perfectly. The perfect cure for the "brown holiday table" blahs! These beans look fresh enough to jump right off the screen, and I think the sesame flavor of the tahini would be such an interesting addition to the traditional menu. I'm not the biggest green bean fan but with that tahini sauce…I'm pretty sure that could change!